We were asked to think about what drew us to the industry and to be honest the years I have been blogging make up a big part of it. I feel like there's a divide between the bloggers and nail techs though, and I'm really interested in learning about the skills and knowledge that techs bring to the field. I think that's the main reason I have right now for wanting to do this. This week's module also talked a bit about nail competitions, and though I don't think my anxiety-prone self is the right fit for the tension involved in competing I think they're really interesting! The intricacies and work put into competition nails has always interested me and I adore when there are large sculpted pieces included. In a dream world I'd love to be able to get to a point where I can do work like that. It's good to have goals, right? So nothing practical yet as I still have all the technical, anatomy and sanitation info to get through first, but it's a good start. Checking in on my 5PP: This is the first module I have done this time around and it definitely didn't take me a full 8 hours, and that's okay. I also got my blog post (you're reading it!) done after I finished the work and I'm not feeling any desire to avoid or procrastinate just yet. So all in all I'd say I'm doing pretty good! 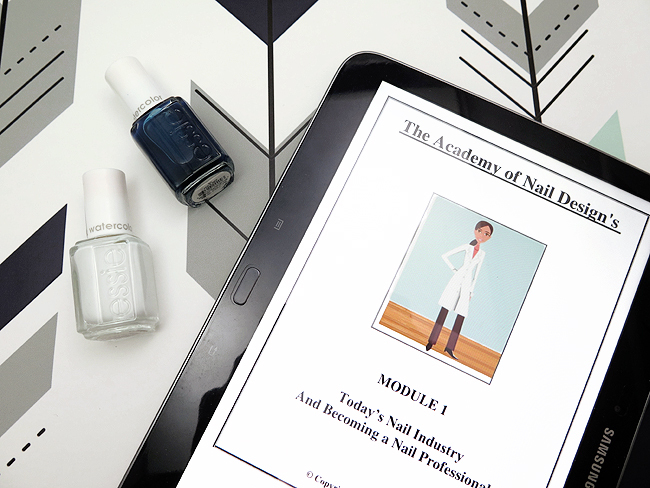 Check out my other nail school posts here! Very interesting to read what you've done in the first week. Can't wait to see more. Excited to see what's to come! I always think competition nails look totally crazy but they really take talent! It'd be fun to be able to do nails like that! I watches a YTvideo of a nail competition, way too much drama and back fighting for me! I really look forward to more posts like this! I've never heard of Nail Competitions, but that makes me feel anxious thinking about competing and having others judge!! So awesome! I should really think about doing this.